Thought I should tell you about one of my favorite summer flowers. If you haven’t tried yet, you’re in for a treat. 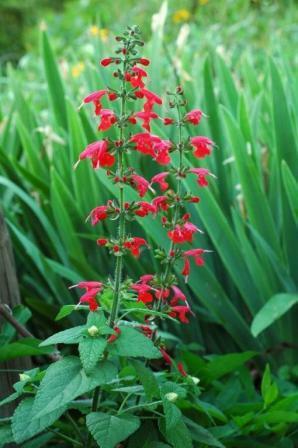 Salvia coccinea – back from seed and already blooming in my garden. DESCRIPTION: Perennial in warmer climates and annual where winter temperatures stay below freezing for more than a few hours at a time. 2-3 feet tall, with 1-2 inch triangular leaves on long petioles (leaf stems) opposite each other on square stems. Flowers are bright red, about an inch long, and arranged in loose whorls along the upright stem. Blooms continuously from early summer to first frost. Several additional cultivars, including pink ones, white ones and bicolored ones. LOCATION: Occurs naturally in dry soils and waste areas from South Carolina to Florida and west to Texas and Central America, the West Coast and in the West Indies. CULTURE: Best in full sun, but it can tolerate filtered light. MOISTURE: Tolerates drought, but flowering suffers without supplemental watering during dry spells. HARDINESS: Can be planted from seed and grown as an annual to USDA Zone 4. Will survive the winters in Zones 7-10 and reseed itself annually in zones 6-8. PROPAGATION: By seeds. Established plantings will return each year by reseeding. USE: Excellent plant for borders and desirable in natural area gardens where it attracts butterflies and hummingbirds and maintains itself year after year without dominating or becoming invasive. Maybe a little invasive at times. NOTES: Seeds of scarlet sage remain in the soil and germinate continuously all year except during freezing temperatures.